Here is an excerpt from the Launch Sermon from Resonate Church. It was part 3 of our Misfits series, Misfit Jesus. You know we, especially as Americans, love to root for the underdog, don’t we? Just think about some of the movies we love. Forest Gump, Rocky, the Pursuit of Happyness, and even Kung fu Panda speaks of the little guy coming out on top. The unlikely hero. These were the ones who were the misfits. Though no one said it could be done, they were out to prove the world wrong. They were going to make their mark, maybe even change the world. Maybe it’s because we’ve all been there, we all know what it’s like to feel like the underdog. 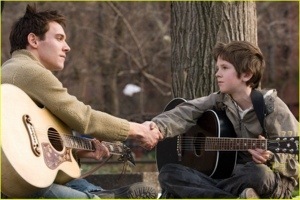 There is a great underdog story in a movie called, August Rush. Ever heard of it or seen it? It is a great movie, especially for music lovers. Two musicians, the woman a classical cellist and the man, a guitarist in a rock band, find themselves one morning awake in each other’s arms after a night of romance and passion. They depart and do not hear from one another again. Come to find out, the woman has conceived and given birth to a little boy. Since the birth was premature, the woman’s father tells her that the baby died, but in reality, the father secretly gives consent to having the baby adopted. This little boy, August Rush, lives in an orphanage all his life, never knowing of his origin, assuming he was rejected by his parents, who simply have no awareness of his existence. He turns out to be a savant musician who can do amazing things on a guitar. August is the classic underdog in a world that seems to be dead set against him. There is something about the underdog that hits us so deeply. It gives hope to all those oppressed. It speaks to all of us misfits who have experienced the stinging pain of rejection. Jesus is the “underdog”, so to speak, that we are going to be discussing. But he was so much more than the underdog we hope will win. He was the conquerer, destined to reign over all heaven and earth. Let’s take a look at a text that was written 700 years prior to the birth of Jesus, when Jesus’ ancestors, the Jews, were taken as captives into Babylon. These people had become major underdogs. They were oppressed in many ways. They could not worship as they pleased or even speak their own language. They were given new names and their identity as the people of God was stripped from them. Did you notice in verse 13 how he says that his servant would be highly exalted and prosperous? But then it goes on to talk about how is face was highly disfigured, scary even. We’re talking like “freak show” here. If you are taking notes, point one would be this. 1. The servant of God experienced deep suffering. As deeply as he sunk in grotesque disfigurement, he was to be even more highly exalted. None of the rulers of the day saw this coming. This must have really resonated with the Israelites at the time who were themselves being despised and rejected. But even as much as we are aquatinted with rejection or they were aquatinted with sorrow, this shows us that this servant was more acquainted. If you are despised and rejected by the Rejects themselves, how low is that? I mean, big deal if you don’t make it into the country club, but it really bites if you get kicked out of your local dollar store. You can’t get much lower than that. This man was rejected by the rejects themselves. So, I’m thinking, this is God’s way of exalting and prospering his servant? How strange of God! If all we read was this portion of the chapter, we might get the idea that God and those who believe in him are gluttons for pain and punishment. Some of you may have the idea that we who believe are just people with an overdeveloped sense of guilt. You’d rather not come to church too much because you’d rather not have a weekly reminder of your own sin. You know you’re not perfect, you don’t need someone rubbing it in your face. These verses are a real bummer if they were all we read. Some of you may have gone to church in the past and all you got was one side of the story. Your sins were shoved in your face and you were scared of hell, so you said the prayer, buying your “fire insurance” to keep you out of the flames of hell you heard about. If that was you, we owe it to you to tell you the rest of the story. You see, the pain of Jesus, the rejection we all face, our own guilt and sin is not the gospel. That is not the good news. Every good story has to have a moment of conflict and so far, all we know is the conflict, the struggle, the bad news. We see all the pain and trouble in the world and, yes, some are trying to ignore it, sing a song, and pretend it doesn’t exist. But others stare at it and blame others even themselves for it, feel endless guilt or anger over it, but it doesn’t change a thing. And he tells us why in the remaining verses of Isaiah 53, the verses I skipped over earlier. 2. God transforms rejection into honor and prosperity. Let’s read Isaiah 53:4-6 now. And then in verse ten through the end of the chapter. What did the suffering of this servant secure for you and me? What does it do for himself? Even if you know very little about Jesus, doesn’t this sound a lot like him to you? Jesus was a walking enigma. He was considered poor, even homeless, but he possessed all things. He was honored and praised like no man of his time, but he was equally as rejected and disdained. So, something was actually accomplished by his anguish suffering and rejection. We all know what it’s like to suffer, particularly to suffer as a result of our own stupidity or sinfulness. But this was not the kind of suffering Jesus experienced. It was because of sin, but not because of his own sin. It was not needless, wasted suffering, it was accomplishing the salvation of humankind. We talked a little bit earlier about whether or not it was okay to ask the question, “Why?” Let’s look at Jesus and his heart while he was hanging on the cross. In Matthew 27:45-46. Jesus, because he was the initial light of the world, experienced a darkness and a rejection deeper than any of us will ever know. His Father, the one he loved, the one who loved him, for a brief moment, had forsaken him. And Jesus, though he probably knew why he was suffering intellectually, the suffering of his human soul could not bear it. I believe that when he gave up his spirit, it was his last act of submission and trust that his Father would soon make it all worthwhile. The secret of the life of Christ and the principles from Isaiah 53 are this. And it’s going to be our third point. 3. There are certain rewards that only the pain of rejection can secure. Think about it. It really starts to make sense. So many of the people we consider eternally significant in our history have had the guts to put themselves in a position to be rejected. Just think about it. Can you think of one very well loved and respected person on this earth who was not hated and rejected by many as well? Those who are willing to face rejection, in the end, receive some of the highest honors. This principle works both in the spiritual and the natural world. Most of us aren’t that courageous. Instead of embracing rejection as a necessary part of reaching something better, we tiptoe around rejection. We fear it. As a result, we remain in the shadows, bound to live mediocre lives, falling far short of the destiny that God has for us. God loves the underdogs. God identifies with them, and God even expects us to embrace rejection for a greater reward. God wants to use the underdogs to show his power through us in an even greater measure. Are you getting excited about the rewards that your own personal rejection could produce? Well, the Apostle Paul was excited about suffering. He says something that has always astounded me in Colossians 1:24. I do not pretend to fully understand what Paul was talking about when he said that he “fills up in his flesh what is still lacking in regard to Christ’s afflictions,” but I do know this.He didn’t enjoy suffering one bit, but he suffered for a clear purpose. And this is what we can glean from Jesus’ and Paul’s example. We should never shrink back from the sting of rejection when we are walking in the way of Christ. There is a greater joy that only the Rejects or the Misfits enjoy. There is a freedom that comes when we willingly embrace rejection for a cause. Paul’s cause was for the sake of the church. What is your cause? What are you made to do? You are made to do what you do for God. Jesus was made to carry the sins of humankind. Paul was made to serve the church, the Bride of Christ. Whatever you are made to do will take courage. But the degree to which you walk in that courage is the degree to which you will be rewarded. Not one of us will have to suffer and be rejected like Jesus was. However, we have a great opportunity to participate in his sufferings, to share in it in big and small ways so that we can also receive some of his glory. Sharing in his glory does not diminish it from him. Jesus actually wants to share his glory with us. But the road to that glory is just a bit of suffering, a bit of rejection. It is a cost, but nothing worth comparing to the glory that is to come. Through the course of events in the life of our character, August Rush actually begins attending Juliard to improve his musical skill. But his “street dad” played by Robin Williams yanks him out of the school and forbids him to attend. August had a choice at that point, to allow the pain of this rejection to cause him to build walls around his life. Instead, through the avenue of music, August refused to close up his heart. Meanwhile, August’s real dad was walking through the streets of New York. After pursuing his long lost love, August’s mother, he had left dejected thinking she had married someone else. As he roamed he happened upon a boy near a park bench. He was intrigued by this boy’s surprising talent and friendliness. Little did he know that he had encountered his son, the son he never knew he had. Both father and son had felt the sting of rejection, but their rejection led to them ultimately meeting and eventually finding unconditional acceptance and love. See, the sting of rejection can do one of two things to us. 1. We can use it to isolate us from others. We can use the stones of rejection to build walls around our lives so that no one can ever hurt us, or even touch us again. 2. We can use the stones of rejection to build a bridge to Jesus, the one who got his doctorate in rejection. – I can tell you with certainty that you never fall from another’s good grace as hard as Jesus fell. You have never had your Father God forsake you. – You never loved as hard as Jesus loved. – You never had so many looking to you for salvation as Jesus did. – While he never minimizes your personal pain, he can certainly say he understands what you are going through. You may have put walls up to keep God at arms length. You may have built walls between you and others because you are afraid of being hurt again. Don’t build walls, build bridges. Like August Rush, you may not know God as your “real dad,” but keep looking. He is out there. In fact, he is right here among us. For those of you believe, I challenge you to live life without fear of rejection. There is one who has already accepted you. Who cares that people reject you when the Creator of heaven and earth has accepted you fully and unconditionally? He is for you, so go after what he has set before you boldly and without fear.